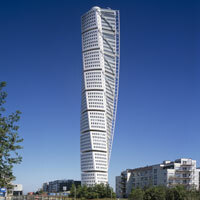 Malmo – Completed in 2005, the Turning Torso was the first twisting skyscraper in the world, rotating a full 90 degrees along its height in nine pentagonal sections. 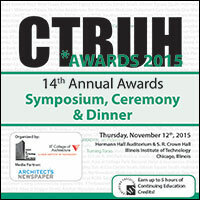 12 Nov 2015 – CTBUH "14th Annual Awards"
Thursday 12th November 2015. Chicago, IL. 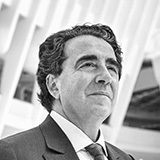 Santiago Calatrava discusses the 2015 CTBUH 10 Year Award Winner, Turning Torso during the 2015 CTBUH Awards Symposium at the Illinois Institute of Technology. View the extended interview here.